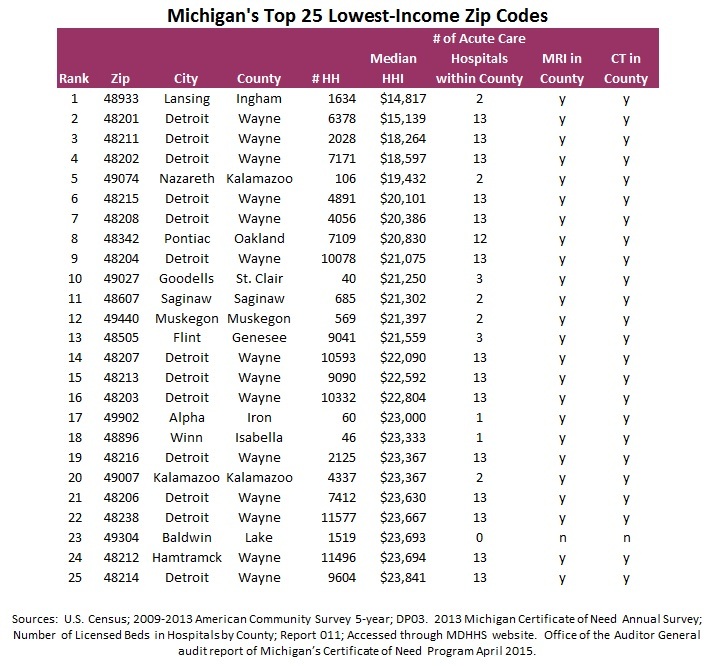 13 out of the Top 25 poorest zip codes in Michigan are within the City of Detroit. These 13 zip codes account for over 95,000 households with an average median income of $21,196. Five hospitals are within the City of Detroit and 13 hospitals are in Wayne County. 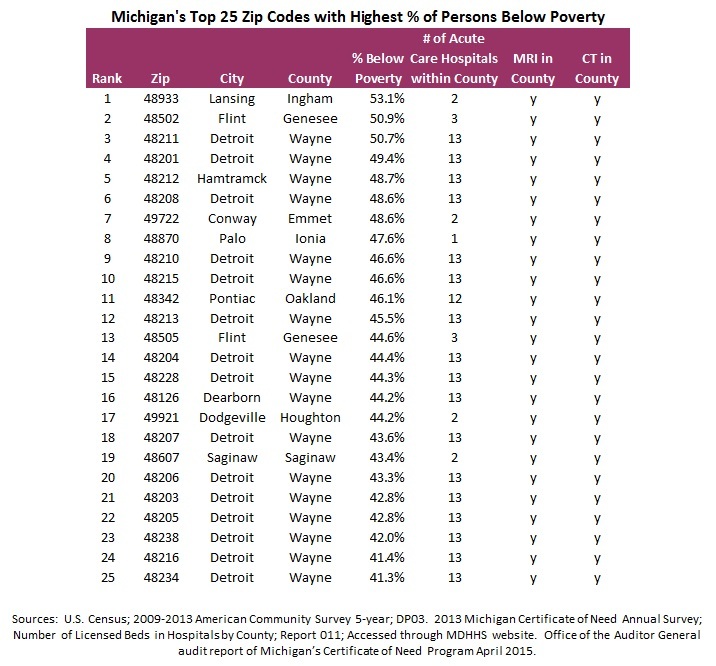 15 out of the Top 25 zip codes with highest percentage of people below the poverty level are in the City of Detroit. Alpha, Michigan (zip code 49902) is located in rural Iron County. Average household median income is $23,000 with only 60 households. Residents have access to an acute hospital within thirty miles. Conway, Michigan (zip code 49722) in Emmett County has 48.6% of people below the poverty level. They have access to an acute hospital within 6 miles. Currently, Michigan has over 26,000 acute care hospital beds. The predicted need is 17,355 beds, thus provided an excess of over 8,500 beds to residents. A 2015 study issued by the Mercatus Center suggests Michigan is shorting residents by over 12,000 beds through the CON program. If the current bed situation has an excess, why would Michigan need another 12,000 beds? 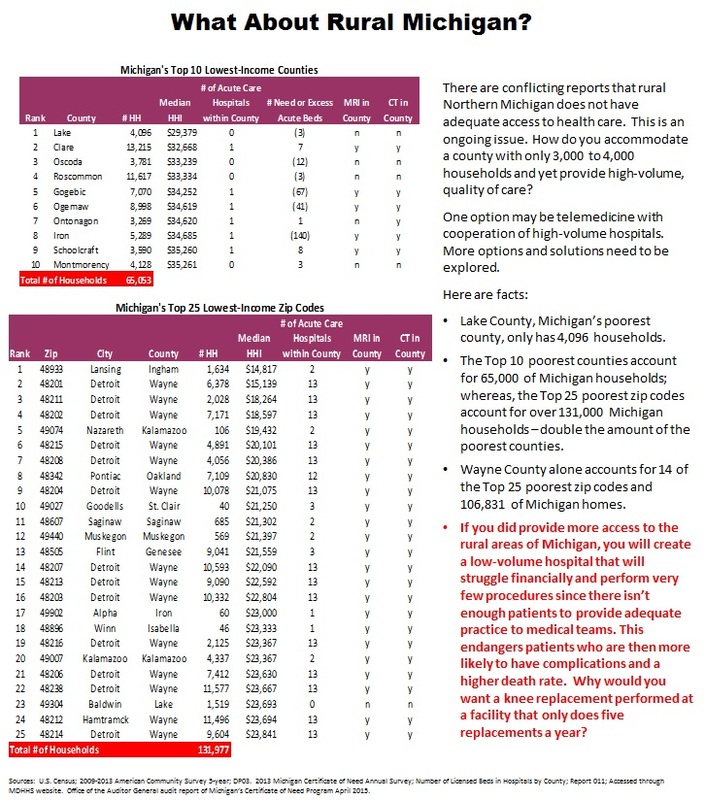 If Michigan were to add 12,000 more acute beds, that would add $18.0 billion in unneeded health care costs. Michigan residents also have adequate access to radio-logical diagnostic services: 90% of the 83 counties in Michigan provide CT scan services and 80% provide MRI services. Also 88% of Michigan counties have at least one surgical service location. By regulating specific services such as open heart surgery and organ transplants to a smaller portion of hospitals, it enables a higher volume of those procedures to be performed by the same surgical team over and over. Thus creating an “expert” in the field and higher success rates. Why would you go to a hospital that only performs three open heart surgeries a year? According to a recent U.S. News & World Report analysis, patients who have surgery at low-volume hospitals “are more likely to die or suffer complications when treated by doctors who only occasionally see similar patients rather than by experienced teams at hospitals with more patients and established protocols.” http://www.usnews.com/news/articles/2015/05/18/risks-are-high-at-low-volume-hospitals. On average, Michigan has the lowest health care insurance premiums among private-sector employers who provided health care benefits for both single and family plans within the 5-state Great Lakes Region. Michigan also has the lowest premiums among companies with 1000+ employees. Join us on Wednesday, December 3rd, 2014, in Lansing at the Capitol. We’ll be set-up to meet and greet in the Speaker’s Library from 10am to 2pm. 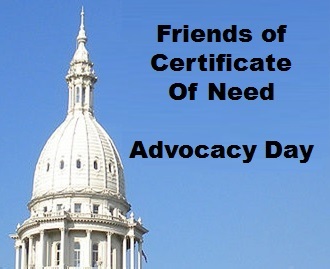 Come learn more about Michigan’s Certificate of Need!